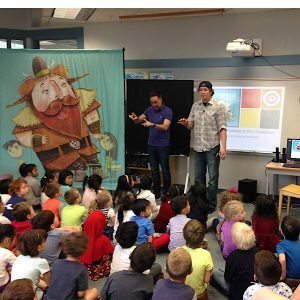 On Thursday, May 25th we were very pleased to host author Grayson Smith at South Slope/BCSD. In our library he presented to all the primary classes over three sessions and read his children’s book, There’s a Norsman in the Classroom. First, he asked us to think about some of the assumptions we might make about people based on what they look like or what they do. We found out he was a police officer, but he wasn’t wearing his uniform. 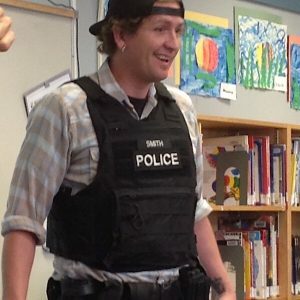 When he asked the students if he looked like a police officer, they said no. However, after he added some elements of his uniform they said yes. 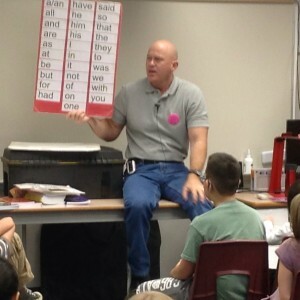 Next he talked about including and excluding people. He said we all make choices everyday about whether we include or exclude. We can invite others to join us in a game or we can say there is no more room for anyone else. When he read us his book, he stopped and ask the students how they thought the children in the story were behaving. Were they including or excluding? We all enjoyed his storytelling very much. Some of our students won copies of his books at the end of his visit. Part of the proceeds of his book sales goes to the Special Olympics, an organisation close to Grayson’s heart. 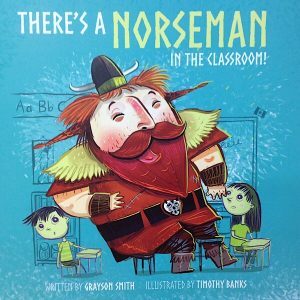 To order There’s a Norseman in the Classroom or any other of Grayson Smith’s books, please click here. 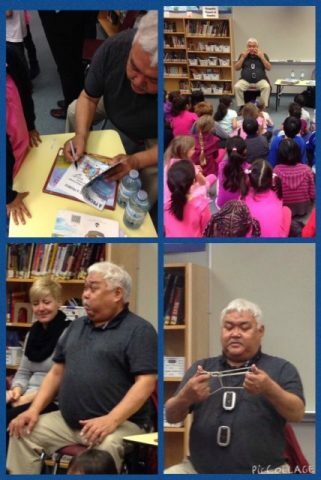 Today we had the pleasure of hosting Inuit author and storyteller, Michael Kusugak. 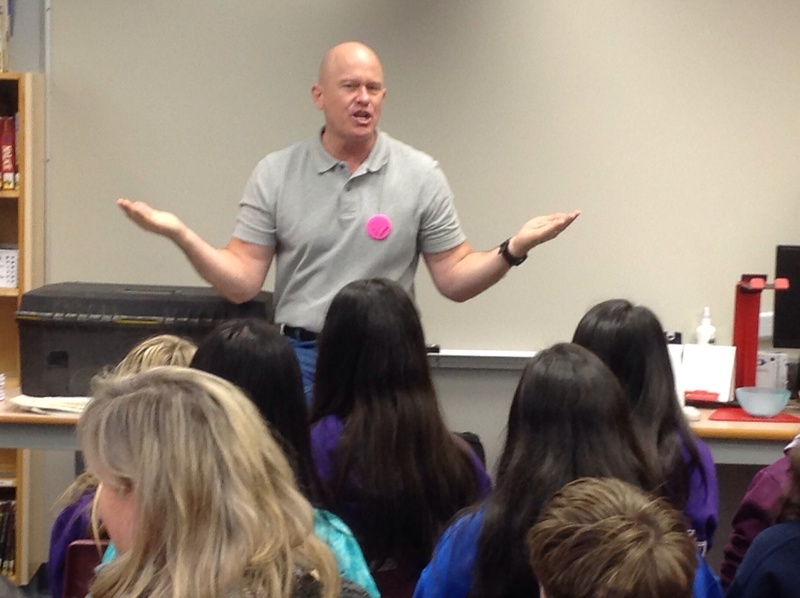 He had two one hour sessions with primary students from BCSD and South Slope. 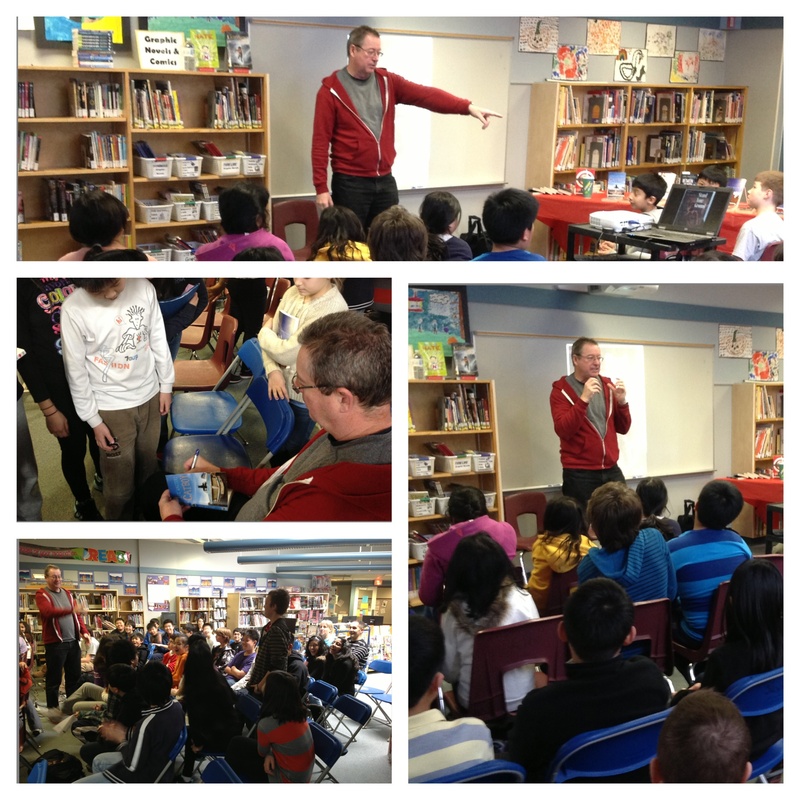 We were thoroughly entertained by his humorous and relaxed storytelling. Michael told us that his last name, Kusugak, means icicle and his middle name, Arvaarluk, means baby bowhead whale. 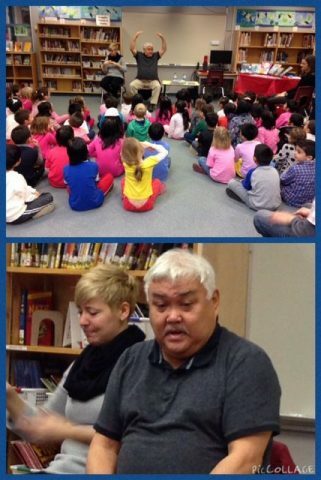 We also learned we knew a few words in Inuktitut like igloo and kayak. He even did a bit of magic and storytelling with just a simple piece of string. While telling the story of The Littlest Sled Dog Michael began singing “Somewhere over the rainbow”, the students joined in and the library was filled with beautiful voices. 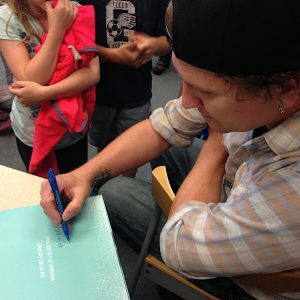 At the end of each session, three lucky students won signed copies of his books. We hope he had as much fun as we did! You can check out his books from the library any time! Michael Wade was here, not Mr.Clean! 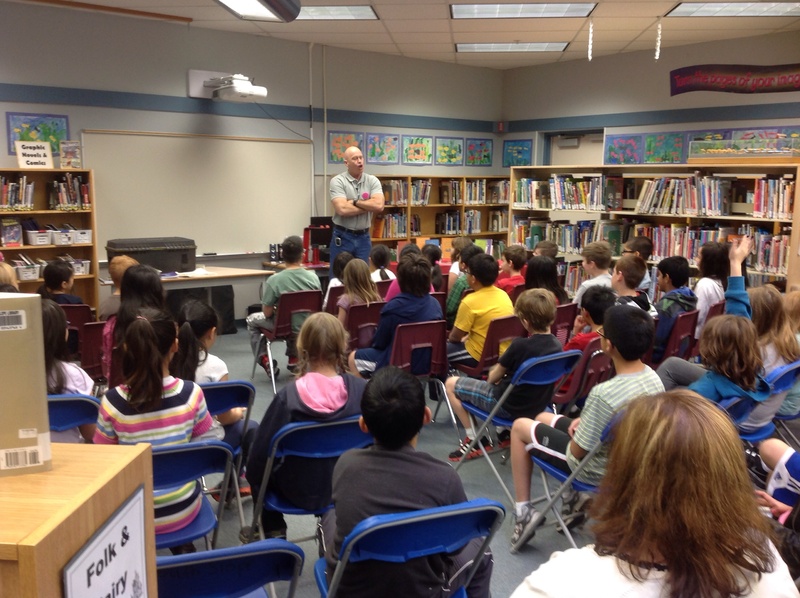 On November 15th, author Michael Wade was here. He began by telling us that, allthough he might look like Mr. Clean, he is definitely not. Mr. Wade told us many funny stories, reminded us of the power of every day words and managed to embarrass a couple of teachers, too. One of his stories involved some very strong toilet paper that two students tried to break, but could not. He reminded us of some of the things that good writers do. For example, he read us a story he is working on now and asked for feedback about how to make it better. He also showed us a sample of his writing and talked about the importance of rewriting. He does seven complete rewrites of each of his stories. In the end, his message was that anyone can be a writer. Thanks for a very inspiring visit, Mr. Wade! Ashley Spires visits South Slope! 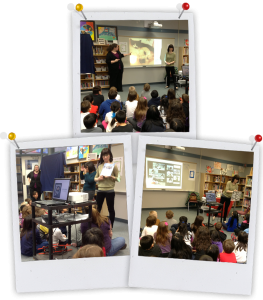 Today we had the pleasure of hosting author and illustrator Ashley Spires. 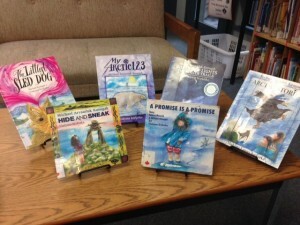 The students have been reading her books in the library and in their classrooms. We are all big fans and were excited to meet her. She talk ed to the students about her creative process and where she gets her ideas. Often her characters begin from drawings she just does for fun. Sometimes they are inspired by feelings, real people or animals, like Binky the cat. 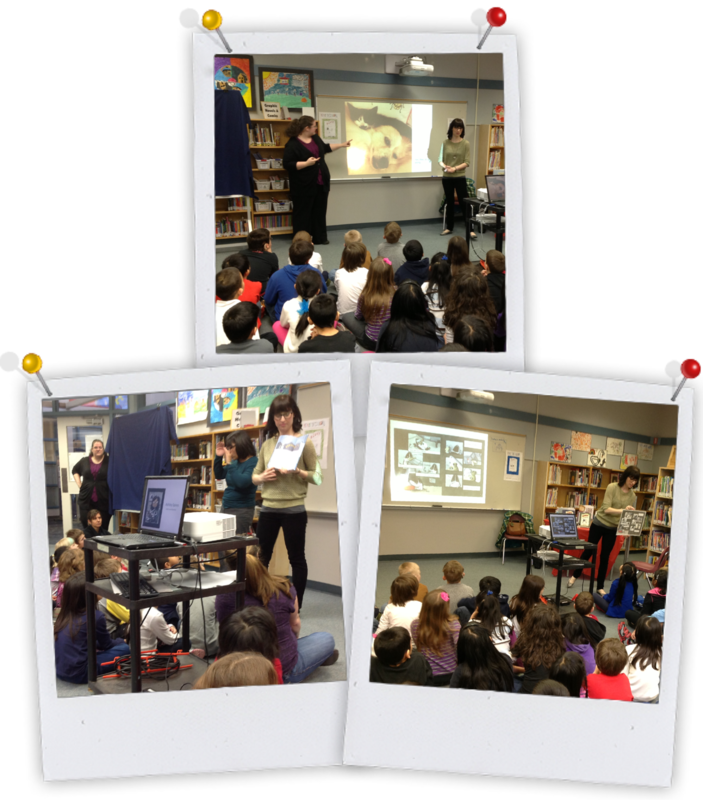 We also learned about the editing process and how hard she has to work to make everything work for her books. For example, it takes one whole week to create one Binky page spread! Wow! One of our favourite parts was when Ashley taught us how to draw her characters. With Divisions 6, 7 and 19 she drew Binky. And with Divisions 8, 9, 10 and 20 the students drew the penguin from Penguin and the Cupcake. Don’t forget to come to the library and check out some of her fantastic books! Yesterday we had the pleasure of a visit from Canadian author, Eric Walters. He spoke to divisions 3, 4 and 5 and then to divisions 1 and 2. We learned how Mr. Walters gets his ideas and how he really gets into his research. He traveled to Africa for his book, Alexandria of Africa, and encountered lions, elephants, deadly snakes and more. 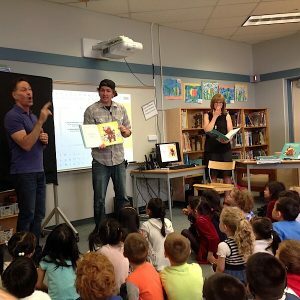 For his book, Tiger by the Tail, he found not one, but two tigers to promote his book and was bitten by one in the process. For his book, Between Heaven and Earth, he climbed Mt. Kilimanjaro with his son. He also picked two of the “cool” dudes in the audience to demonstrate how he creates his characters. For division 1 and 2, he spoke about his charity, The Creation of Hope, and how it partners with Kenyans to care for orphans and also works on community projects such as building wells. This was a great connection to the students’ current social studies unit on water. It was also incredibly inspiring. What did you enjoy most about the presentation? What did it make you wonder and think about? Please leave your comments below. And don’t forget to come to the library to check out a great book by Eric Walters!